Andromeda is a constellation of the Northern skies. Just like the Great Bear she can be observed all-the-year round. 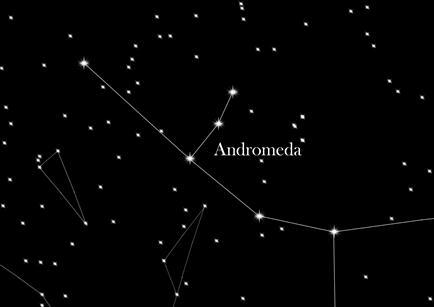 For astronomers Andromeda is a very well-known constellation, given that in her vicinity one can find M 31, the Andromeda galaxy, the spiral galaxy to the Milky Way. Andromeda is connected to the rectangle of Pegasus through the star Alpheratz (to be seen on the bottom right on the picture). The three brightest stars of Andromeda Alamak, Mirach and Sirrah, all lie on an almost perfectly straight line. Under benign weather conditions one can spot a weak gleaming nebulous dot just north of δ Andromedae. This nebular dot represents nothing else but Galaxy M 31, the famous Andromeda nebula.